The British animal welfare charity the Royal Society for the Prevention of Cruelty to Animals (RSPCA) has helped to rescue more than 60 animals from flooding in just 5 days. The beginning of 2014 brought extreme winter weather including wind, high tides and much rain to the UK, including the south of England. This has resulted in widespread flooding, both coastal floods and high rivers breaking their banks over fields as well as residential, business and leisure premises. In a most recent animal rescue, members of the RSPCA's water rescue team and a field officer from 'World Horse Welfare' (the largest rescue and rehoming horse charity in the UK) brought to safety two foals and seven horses from a flooded field. The two foals, a miniature Shetland pony and six horses were trapped in a waterlogged field in Colnbrook (near Slough), Berkshire, after a river nearby burst its bank. The water in their field continued to rise until they were only left to a small boggy patch to stand on. The worried owner of the animals worked with the horse charities rescue the horses and foals, the latter being at particular at risk.
" The river at the bottom of the field had burst its banks and the water had spread over the field these horses were being kept in - right up to the gateway. _ All of the horses were wet and cold, particularly the thoroughbred types with thinner coats. We were most concerned for two of the foals which were also very wet and cold - their coats had become waterlogged and the foals were shivering and could not get warm. _ We had to quickly assess the situation prior to catching the horses and work out the safest way to remove them and load them on to a transporter on a very busy, fast and noisy main road. _ With more heavy rain and cold weather forecast we were all immensely relieved to get the horses to safety. 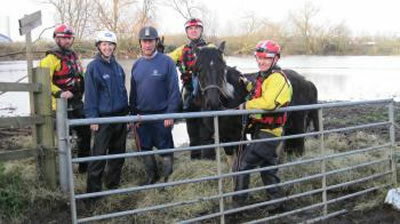 It was great working with the RSPCA flood team who were professional, safety conscious and caring towards the horses. " The six-person team waded through water to catch some of the horses before leading them to safety. The horses are currently in the RSPCA's care while the owner finds them a safer field.
" Over the past few days we have rescued almost 70 cattle, horses and dogs from flood water and are monitoring many more at risk. _We have never rescued so many animals is such a short period due to flooding." The RSPCA and World Horse Welfare have advised horse owners who are experiencing the effects of the continuing bad weather to move their animals to higher ground if possible and to put down sand or straw so that they have a dry place to lie down. As a last resort, owners may need to consider moving their horses into livery or ask if they can move them into a neighbour's field. News is included on the IvyRose website to inform visitors about current health, humanitarian and animal-related subjects, but not to endorse any particular view or activity. Any views expressed in the article above are not necessarily those of IvyRose Ltd.. At least some of the material in this news item was released by the the RSPCA on 8 Jan 2014 and may have been edited (e.g. in style, length, and/or for ease of understanding by our international readers) for inclusion here..